At MIDAS, we know what it takes to design and build live sound consoles for the world’s most demanding tours and installations. One look at the VeniceF confirms that this console is continuing the legacy established by the groundbreaking XL3 and XL4 consoles, then consolidated in the industry-leading Heritage series. From the VeniceF’s horizontal fader panel, through the class-leading parametric EQ filters, to the latest expression of that legendary MIDAS mic pre, this is a console without compromise. Features are apparent everywhere, some of which are unheard of on consoles of this modest footprint. The bus structure remains true to the original Venice concept. Six aux sends, four groups and stereo masters. The F model adds an additional mono bus and a 7 x 2 matrix. All bus outputs feature XLR connectors and insert capability. Routing options have been expanded from the outgoing model too. VeniceF has individual routing to groups, all six aux sends are individually switchable pre or post fade, and the two aux buses designated as monitor (foldback) sends are also switchable pre/post EQ on an individual channel basis. Mono Input Mono inputs pack a host of features, starting with the indispensible MIDAS mic pre, still crafted from discrete components, rather than the cheaper IC option. The 15mm gain pot is surrounded by a quartet of switches, +48V, -20dB pad, polarity reverse and 80Hz hi-pass. A further pair of switches select analogue or digital (FW) input and analogue or digital (FW) direct out pre or post EQ. Switches with LED status indicators are provided for insert and EQ in/out. The equaliser section is an updated XL3 design, featuring four bands of swept MIDAS eq, with the addition of variable bandwith on the two midrange filters. All input channels, groups and masters feature high precision 100mm faders. Stereo Input Stereo inputs have two mic and two line inputs each. Mic inputs feature separate gain for left and right inputs, and the same mic amp functions as the mono inputs. Both mic and line inputs can be used simultaneously, with the line inputs routed direct to masters, while the mic inputs route via the channel. Stereo channels have four-band fixed frequency eq, and a sum-to-mono switch. 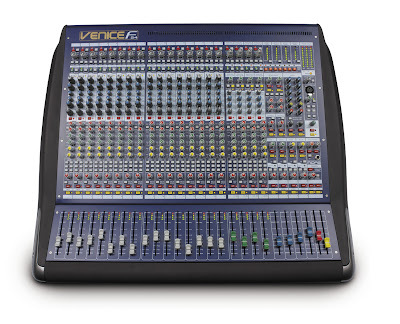 Hybrid VeniceF bridges the gap between analogue and digital audio consoles, and offers the user the ease-of-use, warmth, feel, and zero-latency of analogue, combined with the power, choice and flexibility of outboard digital processing. FireWire® The FireWire interface can be used with any computer fitted with a 1394 port, and is effectively a 64-channel (32x32) digital audio snake, which connects directly to your computer, allowing the use of any 3rd party audio processing software in conjunction with the console. Applications include multitrack recording from the VeniceF’s digital direct outputs, software-generated FX processors driven from aux sends or direct outputs, “plug-ins” inserted on input channel FireWire send/returns. All with a heart of pure MIDAS. Software Although the FireWire interface will work with nearly all computer-based audio processing software, included in every VeniceF package is a free 60-day trial version of RECORD, by Propellerhead. This software suite includes multitrack recording (up to 64 tracks), virtual racks full of FX and dynamics processing, and even a software mixer, which can be patched in parallel with the analogue VeniceF permitting full external digital processing of each VeniceF input channel. Mechanical Many manufacturers cut quality when they design small mixers. At MIDAS we understand that modest channel count doesn’t have to mean compromised performance and a poor feature set. The VeniceF embodies quality, from its rugged construction and top-of-the-range components through to the unmistakable MIDAS sound, it is obviously a truly professional audio console. The frame is a typical MIDAS steel section, providing sufficient strength and rigidity for a hard life on the road. Potentiometers are metal-shafted, and individually nutted to the steel fascia panel. The console is finished in the well-known MIDAS livery, with the addition of striking metallic corner protector inserts. Although specifically designed for live sound, the audio performance, and the addition of a FireWire digital audio interface mean that the VeniceF is equally at home in recording and remixing applications. Height 286.28mm (Including feet) / 11.27"